Apple restored Facebook’s enterprise access roughly a day and a half after it was revoked, according to AppleInsider sources not authorized to speak on the matter. The lifting of Apple’s ban allows Facebook to reinstate internal apps including corporate communications software, a transportation app and pre-release versions of public apps. Apple revoked Facebook’s enterprise certificate on Wednesday after a report revealed the social media giant was illicitly using the system to conduct a data gathering program. Specifically, Facebook was paying users ages 13 to 35 to install a VPN app called Facebook Research on their iOS devices, allowing the company to closely monitor usage patterns. 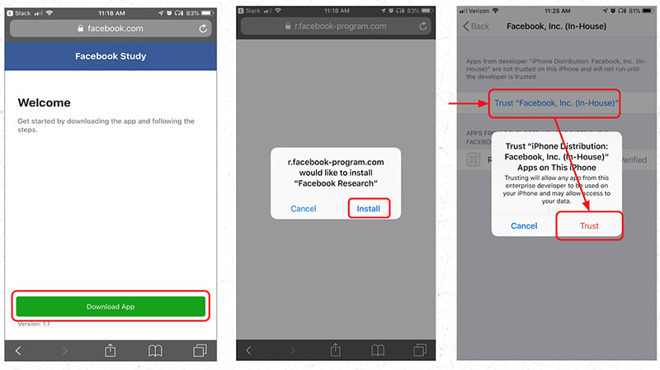 In what Apple characterized as a violation of its developer guidelines, Facebook Research relied on Enterprise Developer Certificates — designed expressly to distribute private internal software — to enable sideloading and root access into a user’s device. Google is in a similar situation after its own data collection gambit, Screenwise Meter, was also found to rely on Apple’s enterprise certificates. Earlier today, Apple disabled Google’s access in much the same way as it handled Facebook’s indiscretions. AppleInsider sources said Apple is working to restore Google’s privileges, though a timeline for completion is unknown.